Clean the chicken and cut into medium pieces. Grind 1 tbsp of black pepper, chilly powder, garlic, ginger, turmeric powder, salt to marinate the chicken and keep it in the fridge for overnight. Heat the oil and fry the chicken pieces until it is cooked and slightly brown. Once the frying is done, use the same oil (but very little) to saute curry leaves, green chilies and onion. Once this is done, add the fried chicken and the rest of the crushed black pepper and bit more salt to the chicken fry. 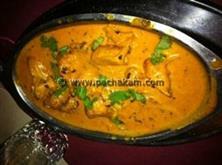 :- You can increase the spice level to make chicken fry even tastier. 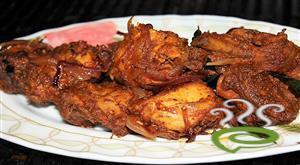 :- Chicken Fry is ready to eat. 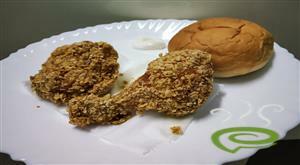 :- You can have chicken fry as snack or with breads. 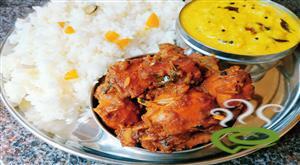 :- Trivandrum chicken fry is very famous in kerala. Recipe is good but there is no need of so much oil instead u can add little water. Nice recipe n easy 2 prepare.. I tried only once and believe me it was really tasty. 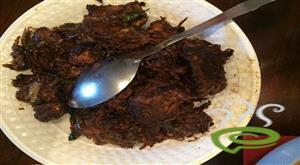 Awesome, was easy to cook and great taste..
We like this recipe very much. I tried it several times and said to my friends. i tried this.came out well. it tastes very super! those who rated it bad was jelous. I tried this and it turned out great....Thanks for the recipe.! It is very tasty and easy to make. 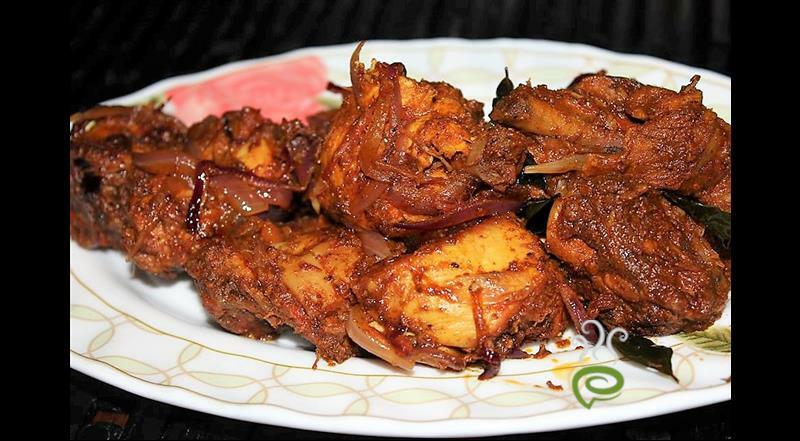 The masala which gets coated all over the chicken after frying is finger-lickingly good! For the confusion about cooking chicken or not,I just leave the chicken closed with the juice which comes out after maribation for nearly 10 min and add oil later when chicken gets half-cooked!Try this way!!! It is better to half cook the chicken before frying by putting in a pressure cooker for few seconds and u can use the gravy also while marinating and it will taste better. Everyone has give 5 Stars, why? There must be a way to cook chicken before frying it. What about some better instructions next time. 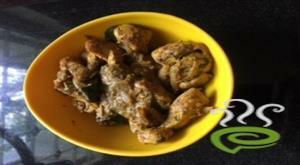 Hi Dear My Mom also will prepare chicken fry like this only but only thing is she wilnt add redchilly powder to this recipe& for this recipe she will add cloves,cinnamon,Elaichi...try this..it will be veryyyyyyyyyyyy tasty....Today i did.... all my friends who came for lunch liked this.. It was very good recipe. it would b better to boil chicken after marinading and add the marinade into the pan when chicken is being fried. excellent. it is not at all bad. Never ever add red chilli to this recipe ,this will partly eliminate the pepper aroma.Instead of fine slices of onions try cubes or small dices of onions.I recommend a wee little of tamarind juice in the final frying process.Any try this as a new recipe. Hey!!! swapna this is really cool. Do share more of the recipies with us. Hey everyone out there do try this out it is really good. Anyone who is looking out for a spicy dish try this u wont be dissappointed. I made this 2day 4 dinner and we all liked it so much. Thank you 4 giving such a wonderful recipe. 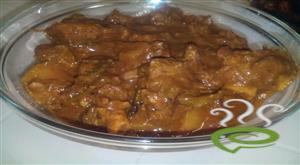 We r expecting more tasty recipe like this from U. My mouth kept watering for hours. Fantastic, My husband like it. 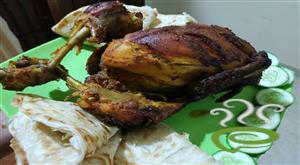 Being a vegetarian, I just followed the guideline and made this chicken for my family and they enjoyed it. It is very good to health to boil the chicken and discard the water and then wash the chicken once again before cooking. Thank you very much!! Very good stuff ...do you have something similar for prawns !!!! it is good i think somebody rated this bad by mistake. Ur recipe is good. It can b made still better. 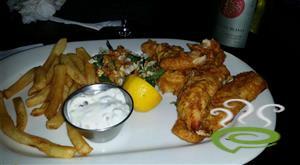 only change i suggest is to half cook the marinated chicken in li`l water and then fry it. chicken wud remain very soft and tasty too. Nice.... I prepared without keeping in Fridge.. It was very good..